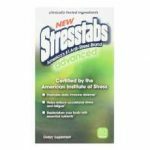 Stresstabs Advanced is a dietary supplement formulated to replace the key nutrients needed by the body to defend itself from the negative effects of stress. It contains a unique combination of essential nutrients for revitalizing the body and keeping it healthy. It is a special immune support supplement with zinc and Ester-C for strengthening the immune system and maintaining normal body functions. This depression supplement is said to reverse the negative effects of stress from the hectic lifestyle today. One 60-tablet container is being sold for $13.74. How Does Stresstabs Advanced Work? Stresstabs Advanced is a formula that contains a combination of nutrients including essential vitamins and minerals for combating stress. It helps replenish key nutrients that are lost during periods of stress. There are also components that work to strengthen the nervous system to prevent anxiety disorders and other mental problems related to stress. The formula also contains ingredients that work to promote relaxation and strengthen the immune system which helps prevent a variety of medical and psychological issues. Stresstabs Advanced Ingredients – Are they Safe & Effective? Vitamin C – Vitamin C is a powerful antioxidant that helps protect the cells in the body from free radical damage. It is also known to boost immunity helping prevent different health problems. B vitamins – They help prevent imbalances on these vitamins which help fight stress and reduce anxiety. Magnesium and Calcium – Magnesium is a mineral that is known to improve nervous system health and it helps prevent anxiety, anxiousness, and nervousness. Magnesium and calcium work together to promote restful sleep. The combination is known to work on sleep problems related to high amounts of stress and anxiety. Vitamin E – It is a powerful antioxidant that helps in protecting the cells in the body. The other ingredients are nutrients that are known to help in combating stress and preventing anxiety. What are the Advantages of Stresstabs Advanced? Could destress your mind thus providing more clarity and focus. Might defend your body against the effects of stress. What are the Disadvantages of Stresstabs Advanced? How Should You Take Stresstabs Advanced? As a dietary supplement, take one or two tablets daily with water. How Much is Stresstabs Advanced? Stresstabs Advanced is sold at a price of $13.74. What are the Precautions to be taken while using this Supplement? If you have any medical condition or are currently taking medication, check with your healthcare provider before taking the supplement. In case of any severe side effect, discontinue use and contact your physician. After taking a close look at Stresstabs High Potency Advanced, it is just an average stress relief supplement. It works mostly for minor stress but isn’t effective for anxiety or depression. The formulation is okay but there is only very little of most key ingredients which makes it inadequate for substantial stress relief. It is still worth buying because of the low price but for moderate to severe stress, anxiety, and depression, there are better antidepressant supplements on the market that is proven to be effective and safe. Depression and anxiety are common disorders that can make daily tasks extremely challenging. Some estimates allege that approximately one in ten Americans suffer from some level of depression and/or anxiety. Symptoms of anxiety and depression include ongoing feelings of sadness accompanied by unease, irritability, tension, and nervousness. While some people require medication to deal with these occasionally crippling symptoms, others may find an all-natural product helpful. An all natural relaxation supplement should promote healthy neurological function. All ingredients should be clinically proven to reduce feelings of anxiousness, sadness, unease, irritability, tension, and nervousness. Below you'll find some of the most effective natural nervousness relief supplements on the market today, in our opinion. I have been taking Stresstabs for 15 yrs and have told many friends about it I am 73 yrs old and still do not take any prescription drugs it is just part of my daily vitamins. Read about The Top Rated Anxiety Relief Aid of the Year 2019.